LADYBUG COTTAGE - 2 BR All season private country cottage on 5 acres. LADYBUG COTTAGE - 2 BR including Newly Renovated Loft -- All season private country cottage. 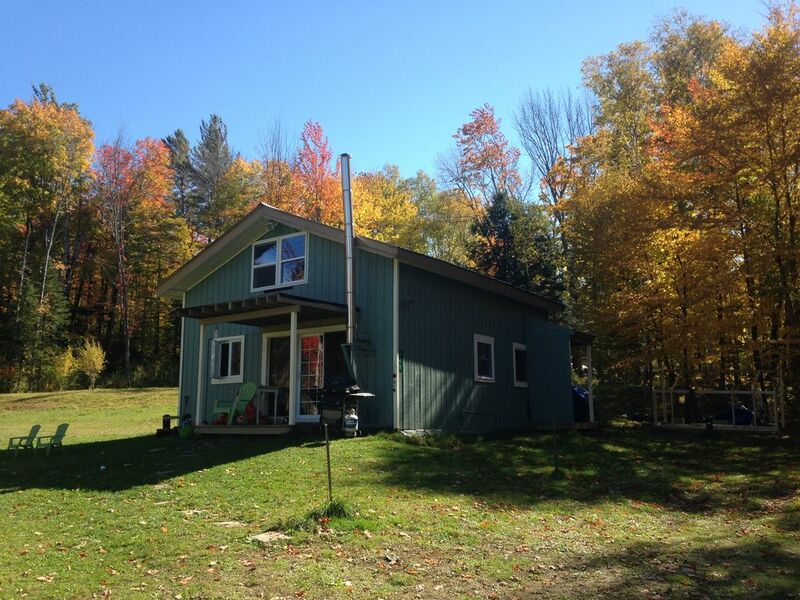 Affordable vacation rental on the back side of Okemo Mountain. On 5 acres adjacent to Okemo State Forest. Excellent mountain views and privacy! 5 minutes to Jackson Gore, 10 minutes to Okemo and 25 minutes to Killington. 1 Bedroom with Queen Bed, 1 Loft Bedroom with Queen Bed, 2 Futon Sleeper Sofas, 2 Single Beds, 1 Bath, Kitchen and Newly Renovated Loft. Perfect for singles, couples or families (Sleeps 1-6). Snuggle in and enjoy the mountain views that go all the way to Killington Peak! Warm wood paneling and VT Castings Wood Stove. Great view of Salt Ash Mountain and Killington 20 miles away!